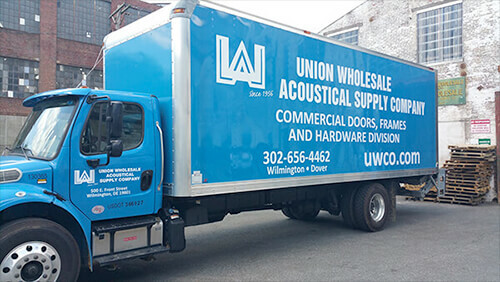 Incorporated since 1956, Union Wholesale Company is on the leading edge of commercial and industrial product supply and installation throughout the Delaware Valley. Drawing on over 60 years of experience, Union Wholesale can partner with you to design, manage, and install the wide variety of commercial and industrial projects being proposed in today's market. Our diversified portfolio of successful undertakings include acoustical ceilings at University of Delaware's Laird Hall, Modernfold operable wall partitions at A. I. Dupont Children’s Hospital, Centria metal roofing and siding at the Delaware Welcome Center, Skyfold vertical folding wall partitions at Christiana Hospital, Comtec toilet partitions at Appoquinimink High School and Petrach interior wall panels at St. Joseph's Preparatory School in Philadelphia, PA. We also offer a complete line of doors, frames and hardware, bathroom partitions and accessories, lockers, gymnasium equipment, fire cabinets, access panels, wall protection/corners guards and more. Delivery is available in one of our recognizable fleet trucks, or by shipping nationwide through one of our freight solution partners. Please explore our website and become familiar with the vast majority of our expertise on finishing touches for your interior spaces. ©2019 Union Wholesale. All Rights Reserved.